Since the 1960s, copper has been the piping material of choice in the United States, for both homes and commercial businesses. There’s a good chance that your home’s plumbing is made of copper, which gives your home some distinct advantages. However, copper piping does have its share of issues. In this post we’ll look at the good and the bad sides of copper, and a few warning signs to watch for. It’s lightweight and easy to install. This is more of a pro for builders and contractors, but is also handy if you’re doing some home renovations. Its flexibility also makes it safer in earthquake-prone areas, since it’s less likely to rupture. It’s more corrosion-resistant than steel. 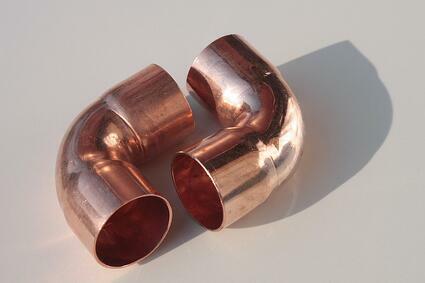 This is what initially made copper piping popular in the 60s, before CPVC piping was widely available. Copper doesn’t rust, and under the right conditions stays clean and shiny for decades. It can last over 25 years. That is, as long as it’s good quality. If your home was built before the mid-90s, or if you suspect the builder took some cost-saving shortcuts, however, be on the lookout for signs of trouble (see below). It’s bacteria-resistant. Copper has been proven to be anti-microbial (unlike steel or PVC) and when it’s dry it can kill e. coli, the influenza virus, and fungal spores after two or so hours of direct contact. The effect isn’t quite as dramatic when it comes to water flowing through the pipe, but it still can make a positive difference in keeping nasties at bay. The quality of copper varies. Unfortunately, not all copper piping is created equal. Since the 2000s, there’s been an increase of builders who have used sub-par piping in an effort to save money. These pipes are much more likely to fail. It’s sensitive to certain types of water. While copper is generally considered corrosion-resistant, it can react to water with high acidity, causing the insides of the pipes to corrode and deteriorate. This can not only add an unpleasant copper taste to your water, but left unchecked, the copper can corrode to the point of creating pinhole leaks—which can then lead to even worse failures. It’s sensitive to pressure. Copper pipes are more vulnerable to high water pressure and can be physically damaged if the water velocity is too high. Suddenly low water pressure. If your water pressure drops rather quickly, it could be a sign of a leak. Get that checked out before it turns into a worse problem. Soggy carpets, ceiling stains, or other tell-tale signs of a leak. If you see any of these, shut off the water if you can, and call a plumber to prevent further damage. If you think you may have copper piping issue, let one of the experts from Ken’s Plumbing come take a look at it. An ounce of prevention can save a lot of expensive damage repairs down the road!